At last, my dedicated viewing of the hit zombie apocalypse TV series The Walking Dead has paid off. I haven’t had any encounters with flesh-eating zombies, but the show inspired me to illustrate the first aid article in the March issue of Horse Illustrated with some original special effects. 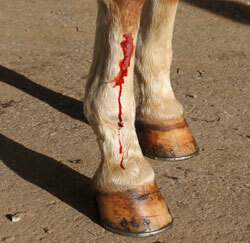 For anyone curious or concerned about the bleeding wound pictured in the article, here’s a behind the scenes look. “Equine 911” by Nancy S. Loving, DVM is a handy first-response guide to equine health emergencies, but we were in a quandary about photos to go with the article. Photographing a real laceration is just a little too ghoulish (not to mention gory), and grabbing a camera in the middle of a crisis would be the last thing on any horse person’s mind. Besides, you just can’t plan this stuff, nor would you want to. The good news is that no horses were harmed for our photo shoot. A little fake vampire blood and “scar skin” from the local Halloween emporium created the nasty looking boo-boo on Chance’s right front. (Who knew you can buy vampire blood year round?) My horse Chance got selected for this glamorous modeling job thanks to his white coat—the better to showcase our so-called wound. After my trip to the costume store, I went shopping with Dr. Loving’s first aid kit list so we’d be fully prepared to treat our fake injury. I also updated my own emergency supplies while I was at it. I tossed anything that had expired, leaked or otherwise gone south, replaced those items, and added a couple from the list that I was missing. I’m hoping all this preparedness means I’ll never need to actually use these items. For years, I’ve held onto a hoof-soaking boot as voodoo to ward off hoof abscesses. So far, it’s working. Nonetheless, our photo shoot was a good dress rehearsal for an equine emergency. HI ad sales rep Jodi kindly demonstrated the techniques from the article, from dressing a wound to taking vital signs. Chance seemed to enjoy all the attention. He did sport some residual fake bloodstains for a few days but was no worse for the wear. Be sure to check out “Equine 911” in the March 2013 issue of Horse Illustrated for essential tips to cope with equine health emergencies. Review our video demonstration of equine vital signs, and download a guide for your trailer or tack room. You’ll be ready for the worst, which is always for the best.